The use of props is one of the most significant innovations brought to the practice of yoga by B.K.S. Iyengar and can become an art unto itself. It can make the difference between doing a pose safely or not at all. Elaborate prop set-ups can shape and support the body, allowing the advanced practitioner to sustain and deepen sophisticated actions in difficult poses. In a therapeutic setting, simple props set-ups can allow the compromised body to re-organize and heal. The primary use of props is much simpler, however. Blocks, belts, blankets and bolsters are used to alter the proportions of the body to allow the posture to be steady and comfortable, as prescribed by Patañjali in his Yoga-Sutra. Here are four examples in which the full expression of the classical pose would be inappropriate, and even damaging, for the average student and where the simple use of a prop can allow the pose to blossom. Coming into the pose on the floor puts a lot of pressure on the upper back and neck. The chest is collapsed and the neck over-stretched. The elbows splay out and the arms cease to effectively support the back. Weight falls into the lumbar area. The blankets lift the shoulders and allow the head to fall back. The neck lengthens, the back comes in and the chest opens. The body can then be organized so that weight is distributed more efficiently through the frame. The belt keeps the elbows in so the arms are more supportive. The chest and shoulders open, freeing up the lungs and heart. Bringing the hand to the floor causes the trunk to pitch forward, the shoulders to hunch and the chest to collapse. The backs of the legs and the lumbar are over-stretched while the back of the neck and chest are improperly constricted. The hand on the block allows the upper body to settle back into alignment with the lower, allowing the entire body to be stretched. Attempting to get the head to the knees over-stretches the upper back and collapses the chest. The lower back is overly pressured, the neck over-stretched and the chest collapsed. Holding onto the belt creates more length in the sides. Supporting the head on the bolster lengthens the neck and alllows the chest to open. Sitting on the blankets takes pressure off the lower back. 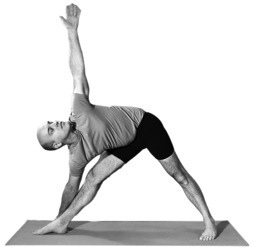 Tightness in the thighs, chest, back and shoulders can limit the opening of the front body in this pose. The bolster opens the chest and the shoulders release, creating length in the front.